B2B you ask? What is she talking about? Well, this past Friday October 5th, I was out in my Soundview Avenue bee yard. I was going through the hives to make sure that all three supers had built out frames in which to store that last drops of nectar from the goldenrod blooming nearby and to put mouse guards on each hive entrance as it is supposed to get cold soon. Near the back three beehives was a box turtle (picture to the left). Cool right? Well, the even neater part was when I was showing this picture to everyone coming to my table at the Greenport Farmers Market yesterday, marvelous young Shelby (a regular at the market) said “the turle’s shell says B2B!” I was so wowed! Thank you to Shelby for making my day! 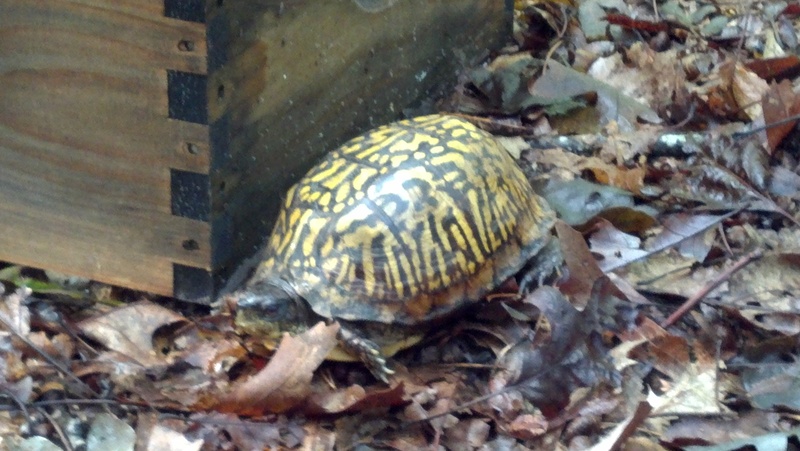 A beekeeping box turtle – something I’ve never daydreamed about before….